Le Noeud Papillon – WHAT IS JAMES WEARING? 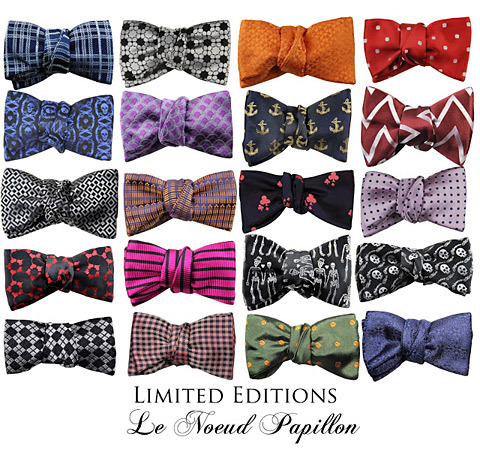 The Sydney based clothier Le Noeud Papillon (from the French meaning ‘the knot of the butterfly’) specializes in bow ties, scarves, ties, shirts, pocket squares and belts. Their fresh take on the classic bow tie struck me as just right for men who want to wear bow ties today. Realized in the finest silks from Como, Italy, most of the patterns are in limited editions and are created specially for Le Noued Papillon, which makes them some of the most sublime bow ties that can be had. 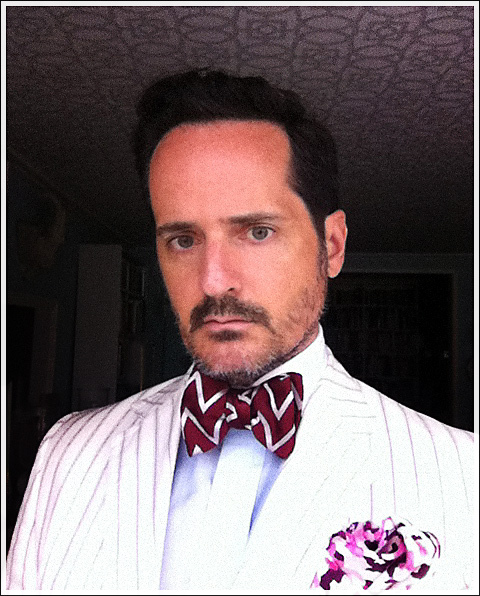 The Limited Edition Zalman silk bow tie in crimson caught my eye with fantastic Deco inspired zig zag pattern and, as you may know, I do gravitate to the substantial bow tie – think: a glam 70’s / 1930’s Gatsby-esq vibe. Do take a moment and peruse Le Noeud Papillon’s shop-online website as well as their brilliant and informative blog. I’m wearing Le Noued Papillon’s fabulous Zalman silk bow tie in Crimson silk with a Gucci white cotton stiped suit, a Simon pale blue cotton/linen shirt with contrast white collar and cuffs, garnet and diamond cuff links, Tom Ford abstract silk floral pocket square and white suede cap toe shoes, vintage Rolex watch, and my fragrance is Creed Royal Water.